A number of private and public sector companies were given the contract for Mine Protected Vehicles. 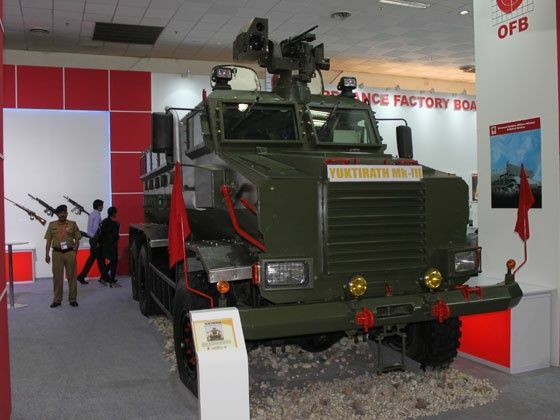 The Yuktirath Mine Protected Vehicle (MPV) MkIII is capable of negotiating all types of terrain, and can withstand an under hull blast of 35kg TNT and under wheel blast of 42kg TNT. It can also withstand a 7.62 Dragunov bullet on its hull and bullet resistant glass from a distance of 10m. Equipped with a Stabilised Remote Control Weapon System, the MPV has and enhanced capability to engage targets during day or night. It also features a self recovery winch at the front and rear. The 210-litre fuel tank is fitted within the armour hull and has a range of 650km. The MPV has a maximum gradeability of 30 degrees and top speed of 50km/h. The Light Armoured Multipurpose (LAM) Yuktirath is a reconnaissance vehicle intended for deployment over all types of terrain as well as asymmetric warfare. It has real time surveillance capability, precision weapon system and mine and small arms protection. The LAM vehicle is equipped with a stabilised remote controlled weapon station for as 7.62/12.7 machine gun. The under hull can absorb impact from 10kg TNT, while the wheels can take up to 7kg. A level IV protection is designed to absorb higher impacts.